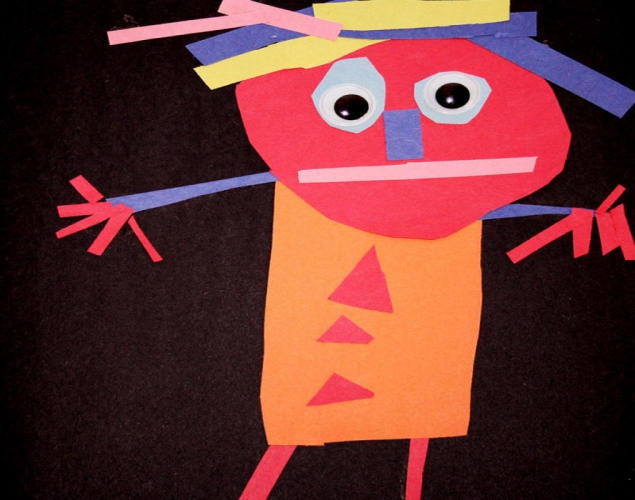 Students work with a variety of pre-cut, geometric, paper shapes to create a picture. Sort the paper cut-outs by their shape. 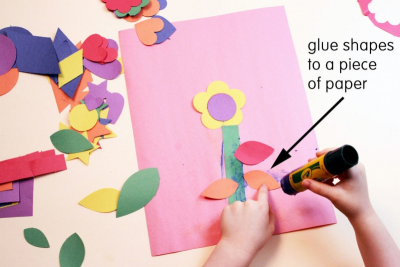 Glue the shapes to another piece of paper. Look at your picture from a distance. - What shape did you use the most of? - How many different shapes did you use? - Did you use shapes to make a pattern? How? - What do you like the best about this picture? Why? - Who would love this picture? Why? glue the boxes together to create a sculpture. Gather, and make available, books about shapes and sorting, for example, The Shape of Things, by Dayle Ann Dodds, and Julie Lacome; The Shape Song Swingalong, by Barefoot Books; Triangle, by Mac Barnett, and Jon Klassen; Square, by Mac Barnett, and Jon Klassen; Circle, by Mac Barnett, and Jon Klassen; Math Counts: Shape, by Henry Arthur Pluckrose; Sam Sorts, by Marthe Jocelyn; National Geographic Kids Look and Learn: Shapes! Board book, by National Geographic Kids; and When a Line Bends . . . A Shape Begins, by Rhonda Gowler Greene, and James Kaczman. Download and display the Shape poster available on this website. Cut out some large geometric paper shapes. Conduct a read-aloud with a book such as The Shape of Things, by Dayle Ann Dodds, and Julie Lacome. Practice sorting a variety of large, cut-out shapes. Invite some students to combine several shapes to create something new. 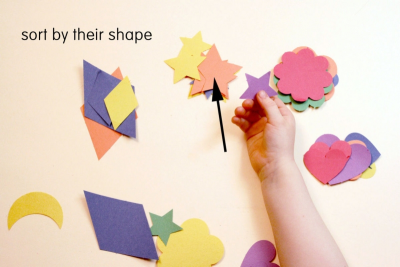 Display and draw attention to shapes and shape words in the classroom. 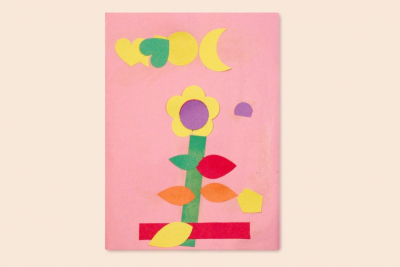 Create a picture using geometric paper shapes. Use your own ideas to make your picture. Repeat shapes to make a pattern. Explain how you made your picture.